Casa Benessere, a restored Italian farmhouse, is set in the magical, untouched Le Marche region which neighbours Umbria and Tuscany. The property, the landscape and the peaceful, inspiring spirit of this area are why we chose the name Benessere, which means well being. Casa Benessere is made up of three buildings. 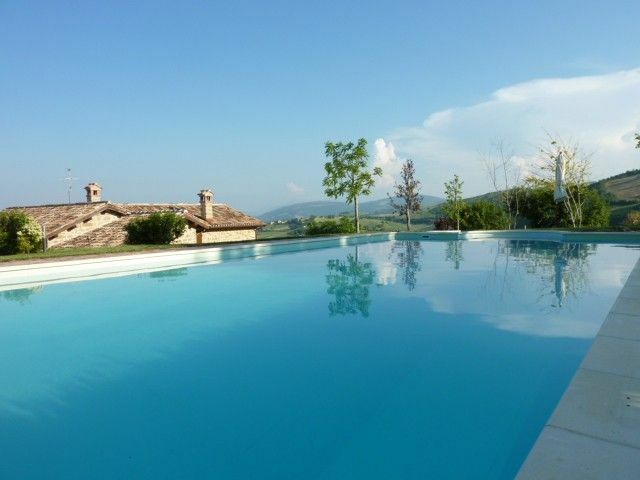 There’s the main farm house with five bedrooms, the old barn with two bedrooms and an impressive studio for yoga & pilates and, on the hill-top overlooking the property, the casa privata. All eight bedrooms are en suite doubles, there is a large swimming pool and a host of contemporary comforts including a large extensively equipped kitchen with a big granite worktop as its focal point. The renovation has been carried out by Italian specialists in historic rural dwellings so we could keep the property’s true, timeless nature. We have also, where possible, selected original and reclaimed materials along with traditional pieces crafted by local artisans. General information: Our Italian caretaker, Antonio, is wonderful and will show you around the house on arrival and deal with any problems during your stay. There is a full complementary welcome pack provided with information on the house, local area and places of interest. The property enjoys completely private landscaped gardens and uninterrupted views over the surrounding countryside. There are plenty of areas around the grounds to take the sun or enjoy the shade. It is maintained weekly during the summer months and has automated irrigation.The swimming pool also enjoys beautiful views and is equipped with 16 sun loungers and plenty of sun umbrellas. It opens in May and closes at the start of October. Meet and greet on your arrival / emergency assistance in English available at an additional cost. We can also organise a local cook and mid-week as required. Eating and drinking: Le Marche is a pioneering region in organic farming. And you can see, feel and taste the difference in the local shops and restaurants. Around the coast, you’ll find excellent seafood and brodetto (fish soup), with each area offering its own delicious variant on the ingredients. Inland there are other delights. This is truffle country, and they have been part of the culture for the past 300 years. Every type is found in the area, so local restaurants serve seasonal truffle dishes all year long. Le Marche is home to the famous white wine Verdicchio. There are currently 11 DOC areas in Le Marche (this denotes a regulated wine of a high standard, so watch out for the label). We like the Verdicchio dei Castelli di Jesi, an elegant dry white, and Rosso Conero Riserva Grosso Adontano 2002, a ruby red with hints of black cherry and plum that goes well with red meat and hard cheeses. Outdoor activities: After all that indulgence, you’ll want some exercise. Hike on the Grande Anello dei Sibillini, or — more gently — through the Gothic Gola dell’Infernaccio, or Hell’s Throat, a twisting limestone gorge. The water park at Cingoli is great for a family day out. There is also skiing in the Sibillini's in the winter months. There are some great walks in the local area and winding your way through the country lanes near Casa Benessere is a joy. We also have four moutain bikes with helmets at the property for your use. The rolling hills and the lake at Cingoli also make for excellent traithlon training. One of the main house bathrooms has a double ended corner bath plus separate shower. This bedroom also has a large walk-in wardrobe. Fully equipped kitchen: 6 ring gas hob plus wok burner, separate drink fridge, 2 ovens, double sink, top of the range A appliances. Large granite island, perfect for cooking courses. Pergola with outdoor dining. Separate wet and dry utility rooms. Garden furniture / loungers to enjoy the stunning views 2 log fires. Modern central heating system throughout. Wide-screen TV with video/DVD player. iPod docking station. Studio for yoga, pilates, art classes or for children’s activities. Fat boy bean bag. 12 x 6m pool with diving board and EU certified security cover. Swimming towels provided. Four mountain bikes with helmets. Parking space for 8 cars. Set in 1.5 hectares of land. I booked this for a Pilates retreat and was not disappointed. From the beginning the owners were helpful, informative and accommodating. Which made the planning of the retreat totally stress free. We arrived after a tiring journey and were greeted warmly by the caretaker with a very thoughtful hamper of goodies. The villa was gorgeous. Exceeding my expectations, the photos do not do it justice. The situation looks out over some wonderful views. There is so much space inside and out. The rooms were clean and beds were comfy. We spent a wonderful week enjoying the pool, yoga space and kitchen. The owner also helped us to arrange a night out in the local restaurant, a wonderful evening wine-tasting with Giovanni (highly recommended) and a massage therapist to come to the villa. Such a wonderful week at the perfect place. Will book again!! Thank you so much for your review and we are delighted how much you enjoyed your retreat. We look forward to welcoming you again to Casa Benessere. This is a fabulous home! We were a group of 8 family and friends staying here for the week. The house has been beautifully restored and was exceptionally clean and comfortable. The kitchen is very well equipped and the host kindly left us bread, cheese and wine for our arrival! Sarah and Caroline were wonderful about communicating with us and answering all our questions. There is a great caretaker who came by to check on us and fix whatever was needed. The pool is gorgeous and we truly enjoyed the relaxing summer days sitting around it and in it. The views of the surrounding countryside are magnificent. There are lovely vineyards close by and wonderful restaurants in San Severino. The town also has a well stocked CO-OP for grocery shopping. We ventured out to Florence and San Marino from here and the trips were relatively easy. The beaches on the Adriatic are easy to get to as well. I would highly recommend this host and property to anyone who wants a relaxing, countryside retreat with local fun available. The Le Marche area is stunning and welcoming. Our stay at Casa Beneserre was more fantastic than we could have ever imagined. We had 9 Adults and 8 Children. We are a group of friends that have known each other for over 20 years and we were celebrating turning 40! Everything is in great shape and maintained well. The Villa is further in the country than we imagined but the drive is worth it. Very peaceful and perfect for relaxation. We hired a Chef for two meals and a cooking class. She even taught the kids how to make pizza - they loved it! Next time we would hire her for more than 2 meals - as finding diner out is hard with 17 people in Italy. The rates were very reasonable too. The pool was a daily hit with the kids. Great lounge chairs and umbrellas for the adults to tan, read and nap too. The rooms could get hot but if you keep it shuttered up during the day, then open everything when the evening cools off - it was very manageable - especially with the fans. We also did a wine tasting. The caretaker drove us out to the winery. We had so much fun and it was a lovely evening. And it was more than just a "taste" of wine, it was 6 wines that we tried with ample pours. Needless to say we bought over 25 bottles of the wine for our week long stay. We did drive into San Severino for our grocery shopping, dining and gelato runs. Also, spent a day at the beach to play in the Adriatic Sea. We would definitely stay here again and recommend it to our family and friends. Caroline was our contact and she was wonderful handling our questions and requests. We were very sad to leave but the memories we created will stay with us for a lifetime! It was really wonderful and we felt everything was done to make this week simple and great. The organisation, the house, the services, everything is perfect. You have to visit and taste the local vineyard, wine is excellent. Thank you, Vincent. It has been a pleasure having your party stay at Casa Benessere. Hope to see you again in the future. Pictures of this villa just do not do it justice. Magnificent views all around. Bedrooms all have en suites and all have great views. The kitchen is amazing with everything you could wish for (big central island, two refrigerators, two gas cookers and dish washer) alongside a large dining room an,d just outside, a wonderful al fresco dining area. The lounge room is simply enormous. While the weather was too cold for using the large pool it would be just a great way to spend time with friends. We stayed for two weeks from late April to early to mid May with friends from Australia, France and the U.K. (around 16 people in all). The weather was magnificent and everyone said they really enjoyed themselves in such a wonderful establishment. All said they would welcome the chance to revisit the villa. Time spent exploring nearby San Severino paid dividends with the discovery of some great restaurants, good supermarkets and even a factory outlet for fine soft leather handbags at about a quarter of the price we would pay for similar goods in Australia. WiFi and internet connections were available free at Cingoli, a 20 minute drive away. The villa is quiet and secluded but the caretaker and other occasional staff are readily available. None speaks English so a knowledge of Italian or advanced sign language would be an advantage. While everyone pitched in to cook (cold smorgasbord for lunch and pastas for dinner) we also engaged the services of the recommended cook for five of our meals which was just great. This is a spectacular house. The views from your bedroom or your sun lounger by the pool are beautiful. The house is spacious and well finished with a large well kitted out kitchen, perfect for preparing your own meals which allows you the opportunity to dine in the tranquil setting of the pergola and watch the sun set and the moon come up and the stars shine. The bedrooms are large and very comfortable and all are ensuite. We spent most of our week lying by the pool reading our books taking in the beautiful scenery. It was so peaceful it felt like heaven on earth. We went for a few drives visiting the local towns. The nearest town San Severino is about 15 mins away and it has a large Co-op store to cater for all your grocery needs; it also has a fresh pasta shop which we frequented on several occasions. The town also had plenty of restaurants and coffee shops to allow you to sit down and take it all in. There is also a local village situated about a ten minute walk from the house. From the house there are great walking and bike trails and most morning we went for a run, walk or cycle. In relation to driving, the roads were very quiet with little or no traffic. There were very few tourists to be seen which was great. For yoga and Pilates enthusiasts, there is a bright spacious studio with amazing views of the countryside. This stunning house situated in idyllic surrounding will cater for your every holiday wish and you will leave truly relaxed and feeling recharged. Set between the sea and soaring mountains, Casa Benessere is the perfect base from which to explore the riches of Le Marche. Untouched by mass tourism, Le Marche remains an undiscovered jewel. The medieval hill-top city of Cingoli, known as the 'Balcony of the Marches' is just 20 minutes’ drive away and has panoramic views over the hills to the sea. Closer to home (15 minutes’ drive), you’ll find San Severino, known as the 'City of Art'. Like Cingoli, it has museums, galleries, churches and monasteries while there are lots of dining choices, bars and shops. Further afield, you’ll discover Urbino, the Renaissance town and birthplace of Raphael (1hr 40min). Then there’s Macerata (40min), celebrated for its annual outdoor opera festival. Throughout summer, open air festivals, palios and pageants take place across all of Le Marche. The region is also home to many natural wonders; the Frassasi Caves, the longest cave network in Italy (45min) and the Sibillini National Park (50min). Golf: There is a golf course 30 minutes drive in the grounds of the Abbey of Fiastra and a course in Monte Conero (50 mins). Ski: There is skiing 45 minutes away in the Sibillini Mountains. Small group rates available. Prices subject to change at owners discretion. It is possible to rent just the main house, or the main house and full studio, in low season. Please contact us for rates. Special services, such as food shop pre-arrival, private chef, mid-week cleaning, available as an additional cost. Deposit made on booking @ 25%, 75% paid 40 days prior to arrival date. Cancelled bookings will not receive a refund.